Many speakers emphasized the rising interest in socialist ideas, particularly since Bernie Sanders’ presidential campaign, highlighted by the tremendous growth of socialist organizations, and in particular the Democratic Socialists of America which has grown by over 10,000 just in the last five months. Trump has since played the role of uniter of the left as millions of people have demonstrated against his agenda. Importantly, many speakers also pointed to the importance of May 1 protests and strikes which immigrant organizations, labor unions, and socialist groups are working to build and organize. Headlining the conference was a discussion with Socialist Alternative National Secretary Philip Locker, the audience, and the Editor of Jacobin and Vice-Chair of the DSA Bhashkar Sunkara. Locker explained Socialist Alternative’s strategy to fighting Trump, including escalating the protests and encouraging independent socialist candidates (read more here). Sunkara agreed and pointed out in order to build a bigger movement, socialists need to grow roots in communities by fighting on local issues. Responding to an audience question, Sunkara agreed about encouraging DSA members to run in local elections, but, in opposition to Locker, said he thought socialists could use the Democratic Party ballot line to run their campaigns. Socialist Alternative has long called for a new mass party for working people, independent of corporate money. Currently, a Socialist Alternative member, Ginger Jentzen, is running to this end as an independent for City Council in Minneapolis this year. At the center of the conference was a strategy conversation about how to defeat Trump and the billionaire class. Speakers’ points ranged from the important development of two left independent candidates running for Seattle city council and mayor, the critical importance of workplace power and unions, and the need to mount a powerful fightback on immigrants rights. The conference hosted a panel focused on Seattle. Panelists included Jon Grant and Nikkita Oliver who are both running as independents for local office, Kshama Sawant, a Seattle Councilmember and member of Socialist Alternative. Juan Bocanegra, a local immigrant rights activist with El Comite who regularly helps plan the May 1 activities in Seattle. Also featured was Jesse Hagopian, a Seattle Public Schools teacher who helped lead the MAPP boycott in 2013 and is member of the ISO. Kailyn Nicholson spoke for Socialist Students which organized inauguration day protests in Seattle. Rounding out the panel was David Parsons, president of UAW 4121 representing grad students at the University of Washington. Jon Grant, who is running for Seattle City Council, pointed out the dominance that big developers have over local politicians. He explained the importance of housing policy allocating resources for affordable housing, the need for rent control. He explained his view on the importance of running independent from the two parties of big business and is running as a democratic socialist. Kailyn Nicholson, from Socialist Students, raised the role that students can play by raising demands like Medicare for All. She pointed out how the system prioritizes the profits of billionaires but “if we took the top 500 corporations into public ownership, we’d make every job a living-wage job, and every worker a union member.” She closed by stressing the importance of building toward huge May 1 demonstrations. “The Seattle May 1 coalition has officially endorsed the idea of a strike on Mayday,” reported Juan Bocanegra. He emphasized that activists need to work together in solidarity. 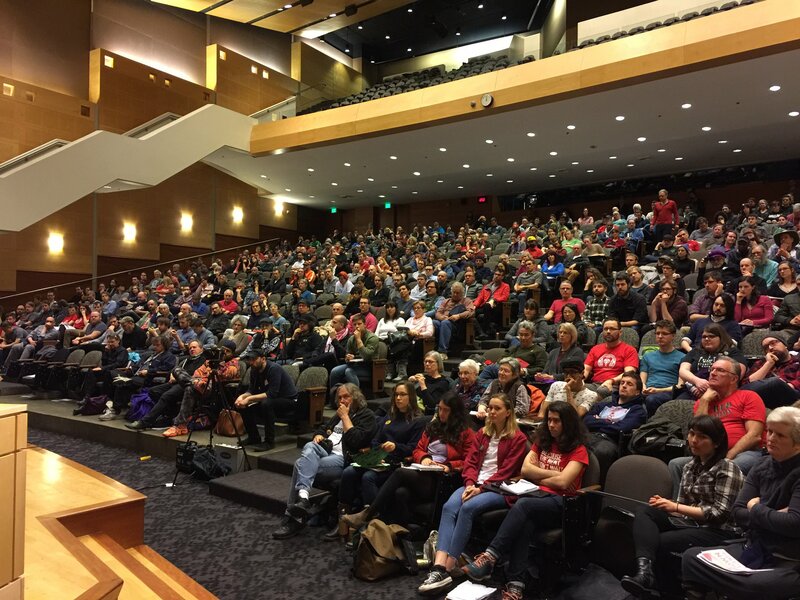 Jesse Hagopian reported on the efforts of the Social Equality Educators, a left caucus within the Seattle Education Association, to push for a strike vote for May 1 in the union. David Parsons talked about how his union, UAW 4121, will soon be holding a strike vote for May 1, and their efforts to make UW a sanctuary campus. Kshama Sawant summed up the panel by saying, “The Trump administration can be defeated, but we need a strategy. A socialist strategy.” She explained that our progressive victories in Seattle have come when a movement in the streets is united with a working-class representative in city council. She argued that we need to take that approach nationally, to build a powerful movement against Trump and run independent and socialist candidates around the country. Further she pointed to the crucial discussion around strike action that has begun to emerge. “We need to use our social power against Trump and the Billionaire Class. We need to hit them where it hurts, by shutting down their profits,” she said. She called for unity in organizing the largest May 1 protests possible and for taxing the rich. And she pointed to the importance of Jon Grant and Nikkita Oliver’s independent left campaigns, in both taking on the Seattle Democratic establishment and in setting an example nationally. Overall, the conference was a friendly and serious exchange of ideas about strategies, tactics, and politics on how to fight Trump’s agenda. An engaged and enthusiastic audience brought many important questions during the second session.